Marion County, location of 1 of the best Pleistocene fossil sites in southeastern North America. 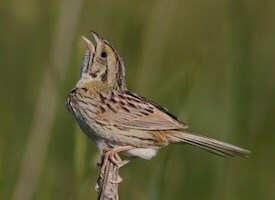 Henslow’s sparrow. This species prefers weedy grassland habitat. Ducks and rails prefer wetlands. Passenger pigeons and woodpeckers need woodlands. The composition of birds reflects varied habitats near this locality during the Pleistocene. The African hunting dog (Lycaon pictus meaning painted wolf) stars in many nature documentaries, but few people are aware that close relatives of this species formerly lived across Eurasia and even into North America. At least 2 different species occurred in North America during the middle Pleistocene between ~1.5 million BP-~300,000 BP. Fossil remains of Xenacyon lycaonoides were excavated from 2 sites in Alaska and 1 in the Yukon. The first paleontologist who looked at these specimens misidentified them as dhole (Cuon alpinus) teeth, but a more recent examination of the dentition determined they belonged to a canid more closely related to African hunting dogs. These scientists also examined the only other dhole fossils found in North America (from San Josecitos Cave in Mexico) and did confirm that identification. The other American species of canid closely related to the African hunting dog was Xenacyon texanus, and it’s known from just 1 fossil locality–Rock Creek in northwest Texas. The sum total fossil remains of X. texanus are part of 1 jaw with teeth, a leg, and a shoulder fragment. Based on this scant anatomical material, scientists believe X. texanus was slightly larger the X. lycaonoides which was about the size of a timber wolf. Two extinct and little known species of canid, closely related to present day African hunting dogs, lived in North America during the middle Pleistocene. 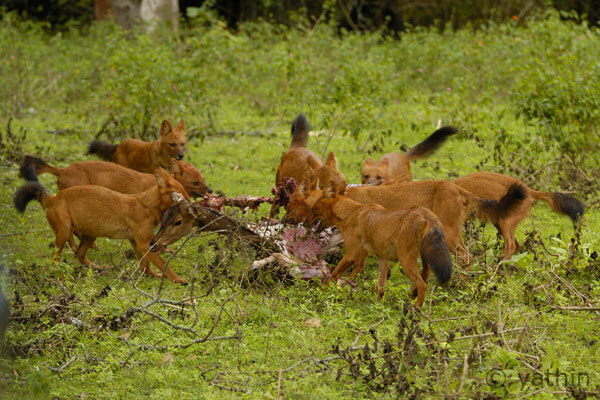 Dholes tearing up a deer. Fossil remains of this canid have been found from just 1 site in North America. It originated in Asia, yet it inhabited Mexico during the late Pleistocene. It must have been more widespread in North America than the fossil record indicates. Wolf fossils in North America are much more common than those of X. lycaonoides, X. texanus, and Cuon alpinus. This suggests these species of hunting dogs didn’t compete well with American wolves. During the middle Pleistocene X. texanus would have occupied the same ecological niche as Armbruster’s wolf (Canis armbrusteri), the probable evolutionary ancestor of the dire wolf (Canis dirus). Nevertheless, X. texanus did live in North America long enough to have evolved into a different species from X. lycanoides. Obviously, they were more widespread and successful than the fossil record indicates. It’s possible this species persisted into the late Pleistocene but was restricted to regions where their remains were not likely to be preserved. The only dhole fossils found in North America were discovered in Mexico, yet this species originated in Asia, crossed the Bering landbridge, and must have occupied large areas of North America before colonizing Mexico. Dholes co-existed with dire wolves and timber wolves (Canis lupus) in North America for some undetermined length of time. The oldest dire wolf fossil dates to 252,000 BP (from a uranium-series dated deposit in South Dakota). Timber wolves crossed the Bering landbridge 100,000 years ago and co-existed with dire wolves in western North America until the end of the Pleistocene. It’s not known when dholes crossed the Bering landbridge. Timber wolves and dholes are not known from the fossil record of southeastern North America. I think dire wolves kept these other big game-hunting canids from occupying this more wooded region where prey was less abundant than on the grassy plains of the west. Rock Creek, the only known fossil site where Xenocyon texanus has been found, is located just north of Plainview, Texas, represented by the dot on this map. The Rock Creek fossil site is located just north of Plainview, Texas. This is the only locality where remains of X. texanus have ever been found. E.L. Troxell excavated this rock quarry and published his findings in 1915. Along with the rare canid, he found the remains of gopher tortoise, giant tortoise, Harlan’s ground sloth, glyptodont, Imperial mammoth, flat-headed peccary, camel, llama, Soergel’s musk-ox, and horse. He identified the remains of another canid as dire wolf, but he was probably in error. The geological formation where these fossils were found is thought to be no younger than 400,000 years BP. Dire wolves probably didn’t evolve yet, so the canid remains probably should be referred to as Armbruster’s wolf. The composition of species excavated from Rock Creek suggests the region during this climatic phase consisted of arid grassland and scrub with milder winters than those of today. Some scientists assume it was frost free due to the presence of giant tortoise, but I believe this species could survive light frosts. Although winters were warmer then, it’s not safe to assume there were no frosts. The horses, camels, and peccaries likely served as dinner for X. texanus. I self torture myself every Wednesday: I go in my backyard and do 150 pullups, jogging in place between sets, and I follow this exertion with yardwork such as cutting the grass with a scythe or chopping firewood with a dull axe. (Lawnmowers and chainsaws are noisy and unpleasant and I use neither.) Three weeks ago while torturing myself, I discovered a male box turtle (Terrapene carolina) sitting on the edge of a shallow burrow consisting of leaf litter and pine straw. I didn’t think this would be sufficient cover to protect a cold blooded reptile from forthcoming frosts. Yet, this turtle was still alive after the first frost of the year. I perused the scientific literature and learned from 1 study that the average depth of a box turtle’s winter burrow in Ohio is only 2 inches, though some burrow as deep as 7 inches. Snow further insulates them. Box turtles range as far north as Maine and apparently they can survive when their body temperatures fall below freezing. However, winter freezing is their leading cause of mortality. Hard winters diminish their populations to some degree. A male box turtle that may spend the winter in my backyard. Male box turtles have red eyes. Females have yellow eyes. 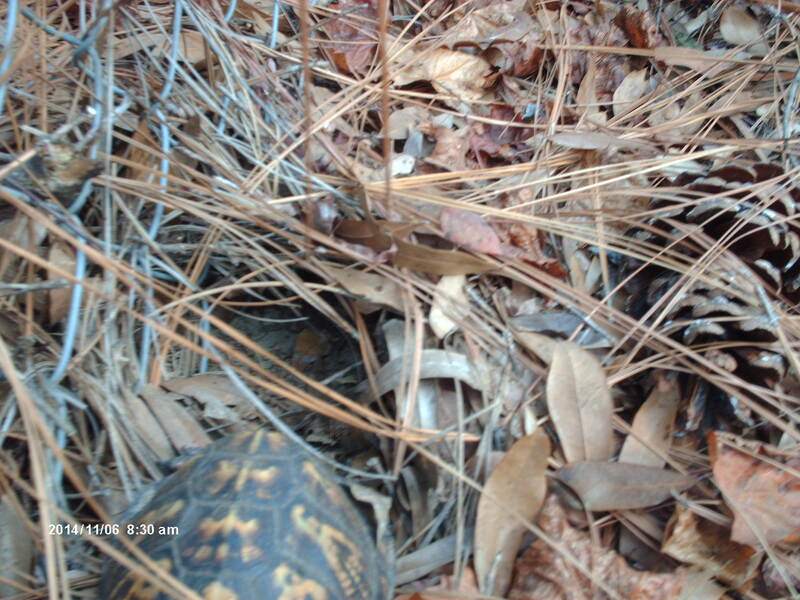 Note the burrow into the leaf litter and pine straw behind the turtle. Despite their terrestrial existence, box turtles are more closely related to aquatic turtles than land tortoises. Also note how shallow this burrow is. 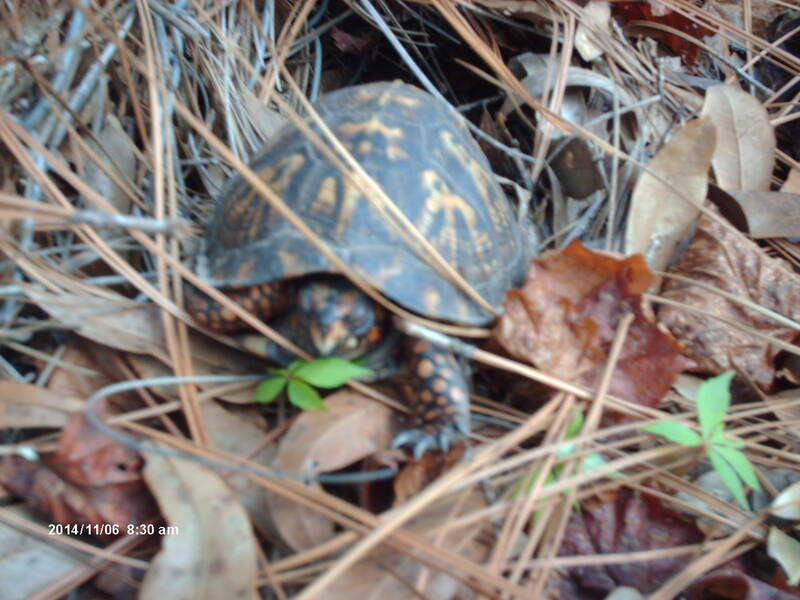 Box turtles can survive hard freezes covered by just 2 inches of leaf litter and/or soil. Various climatic fluctuations during the Pleistocene isolated populations of box turtles. These changing conditions resulted in the regional variations in box turtle morphology evident today. There are 6 recognized subspecies of eastern box turtle: the eastern (T. c. carolina), the Florida (T.c. bauri), the 3-toed (T.c. trungus), the Gulf Coast (T.c. major), the Mexican (T.c. mexicana), and the Yucatan (T.c. yucatan). Moreover, there was a large extinct species (T.c. putnami), known from Pleistocene fossil sites. 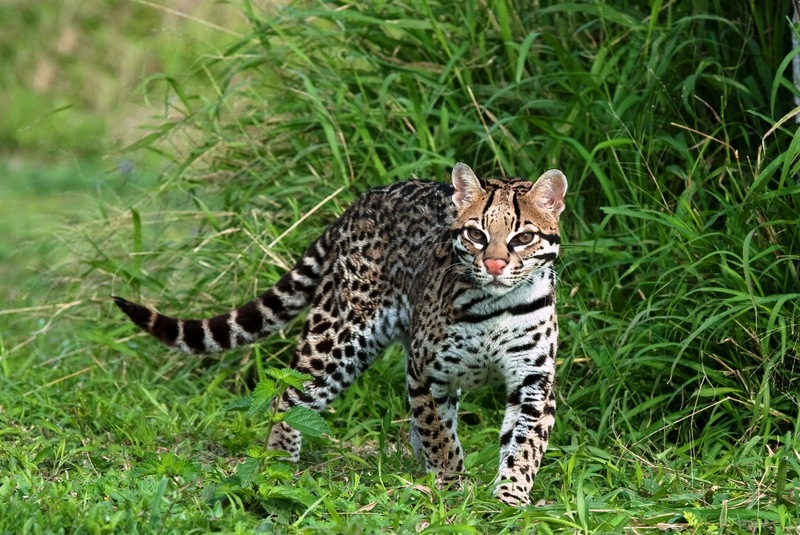 All of these subspecies readily hybridize on the borders of their ranges. A late herpetologist, William Auffenberg, and others hypothesized T.c. putnami preferred warm coastal grasslands, while T.c. carolina inhabited forested landscapes. Accordingly, fossil remains of T.c. putnami could be used as evidence that a particular fossil site was of an interglacial age, and the presence of T.c. carolina was evidence a specific site was of glacial age. But some remains of T.c. putnami were found at the Jones Creek fossil site in Missouri which dates to a climatic phase when jack pine and grass dominated the local flora. Jack pine no longer occurs south of Michigan, and its presence in Missouri is evidence of a cooler climate than that of today. I don’t believe Dr. Auffenberg’s hypothesis is valid. T.c. putnami was widespread during the Pleistocene and likely well adapted to both glacial and interglacial conditions. Partial carapace of the extinct subspecies of box turtle, T. carolina putnami. Too bad the colors have faded away. A recent comprehensive study of box turtle morphology and genetics determined that there was no evidence for the existence of the Gulf Coast subspecies, T.c. major. 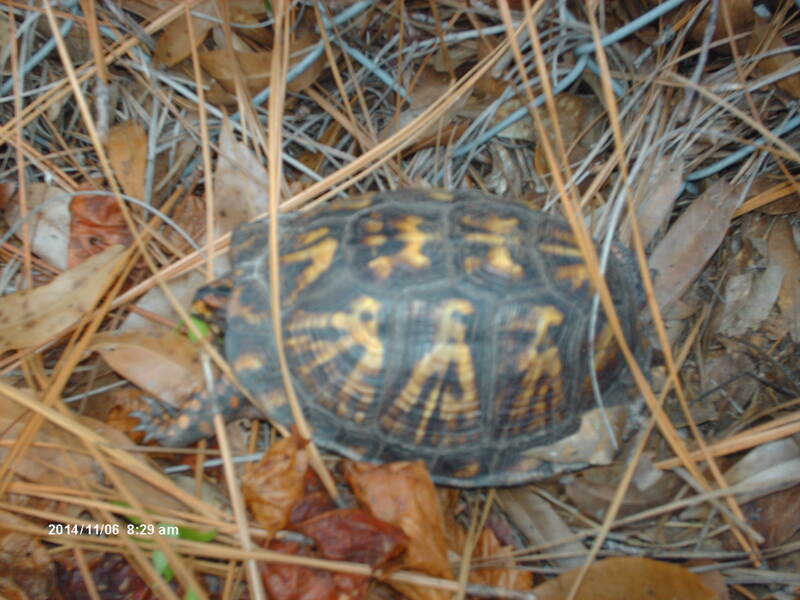 Instead, the authors of this paper suggest box turtles found on the Florida panhandle, thought to be this subspecies, are descended from hybridization between the eastern subspecies, T.c. carolina, and the extinct subspecies, T.c. putnami. This would explain the larger size of Gulf Coast box turtles compared to other subspecies. For some undetermined ecological reason the once widespread Pleistocene ecomorph of box turtle still occured as a relic population in this region, and the survivors hybridized with another now more common subspecies. Box turtles are amazing survivors. They are omnivorous, capable of eating any plant matter such as fruit, flowers, and fungi; and animal matter including insects, worms, snails, birds’ eggs, and carrion. And they can survive scarcity of food because they have slow metabolisms. They can live to be 100 years old and can regenerate when severely burned. Females can mate once and lay fertile eggs for 4 years. Box turtles survived millions of years of climatic fluctuations and still live and can be found in my backyard. Kettle lakes are common geological formations found in North America in any region once covered by a glacier. When glaciers recede they often leave large chunks of ice behind. Both wind and water borne sediment covers these blocks of ice, temporarily insulating them, but eventually the ice melts and forms a lake. Diagram showing how a kettle lake forms. 20,000 years ago, the edge of a mighty glacier advanced as far as what today is Manhattan Island, New York. A narrow strip of unglaciated land, about 50 miles wide, existed on the continental shelf between Manhattan and the Atlantic Ocean. After the glacier receded it left a kettle lake behind on the southern end of Manhattan. The lake held clear glacial meltwater and was continuously fed by underground springs. It was 70 feet deep–evidence the block of ice left behind had been quite large. For thousands of years, Indians used this lake as a source of freshwater because the rivers surrounding Manhattan are tidal in nature and too salty to be potable. An Indian settlement existed on the southwestern edge of the lake in 1604 when the Dutch first established a colony on Manhattan. The Dutch called the lake “Koelch,” meaning small body of water, but when the English took over the island, the word was mispronounced, and thereafter was called “Collect Pond.” A steep 110 foot tall hill, known as Bayard’s Mount, occurred on the north side of Collect Pond, and another steep hill, Kalch Hoek, bordered the west side. A freshwater marsh existed to the south of Collect Pond, and 2 creeks served as outlets for the kettle lake’s overflow. Lispenard Creek drained into the Hudson River and Old Wreck Brook drained into the East River. Fish likely colonized Collect Pond through these creeks. Species of fish recorded to have lived in Collect Pond included pumpkinseed sunfish, redfin pickerel, eel, and killifish. Collect Pond was a beautiful and valuable natural resource. 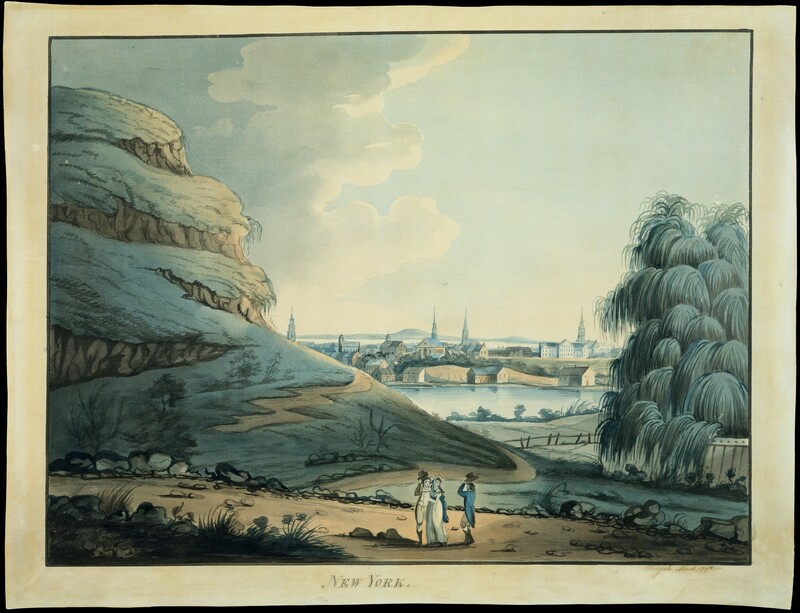 It provided fresh drinking water for all of Manahattan for almost 200 years, as well as winter ice skating, and summer recreational fishing. Man then turned this heaven into hell. A portrait of Collect Pond painted in 1798 by Archibald Robertson. The weeping willow is not a native species and must have been planted early in the century. After poison from a tannery polluted the pond, developers filled it in with dirt from the hill (Bayard’s Mount) in the foreground. That hill also no longer exists. The New York City Municipal Building now stands where Collect Pond used to be. Aaron Burr was the Vice-President of the United States between 1800-1804. In 1808 he responded to the ecological disaster of Collect Pond by founding the Manhattan Water Company. His stated goal was to bring water from upstream to downtown, but instead he used the assets to start JP Morgan Bank. The city eventually built an aqueduct to bring water from a source off the island. Aaron Burr is best known for his duel with Alexander Hamilton. Burr fatally wounded Hamilton in 1804. Hamilton was the Secretary of the Treasury and a member of Thomas Jefferson’s cabinet. Fighting duels was a childish custom. Imagine if Joseph Biden challenged Hillary Clinton to a duel. JP Morgan is still run by childish crooks, but at least they don’t fight duels. 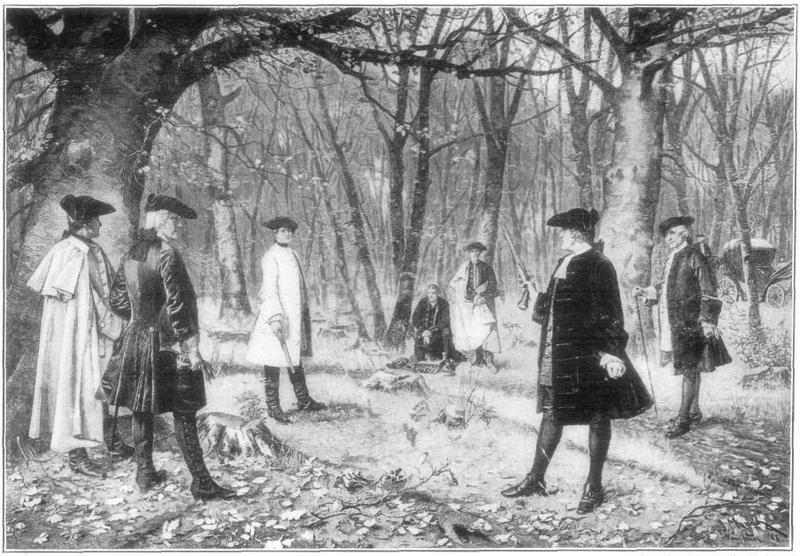 Portrait of the duel between Aaron Burr and Alexander Hamilton in 1804 drawn by J. Mund. Aaron Burr founded JP Morgan for the purpose of funding a project to supply fresh water to New York City after Collect Pond was poisoned. This portrait is not accurate. The seconds had their backs turned so they wouldn’t have to testify in court as witnesses. The nice trees I observed on Berry College campus last week inspired me to study the inventory of Georgia’s National Champion Trees published by the Georgia Forestry Commission (available online http://www.gfc.state.ga.us/forest-management/champion-tree-program/). Georgia has 20 national champion trees. Foresters measure the circumference at 4.5 feet above the ground + height + crown width to determine whether a tree is a champion of its species. Some species have a range that is restricted to Georgia, so of course, the national champion of that species would be found in state. The Georgia plume (Elliotia recemosa) is a small rare tree known from just 9 sites in the Georgia sandhills. The largest known Georgia plume is in Tattnall County and is 47 feet tall with a diameter of a foot. Other species have a limited regional range but are most common in Georgia, so the champion of that species would be expected in state. Georgia oak (Quercus georgiana), first discovered on Stone Mountain in 1840, is a species of red oak that grows on rocky outcrops in the southern Appalachians. The national record Georgia oak is found in Clarke County and is 59 feet tall with a diameter of just over 2 feet. The Oglethorpe oak (Q. oglethorpensis), a species of white oak not recognized till 1940, includes a population of less than 1000 specimens in disjunct locations primarily on the Georgia Piedmont but also in Mississippi and South Carolina. 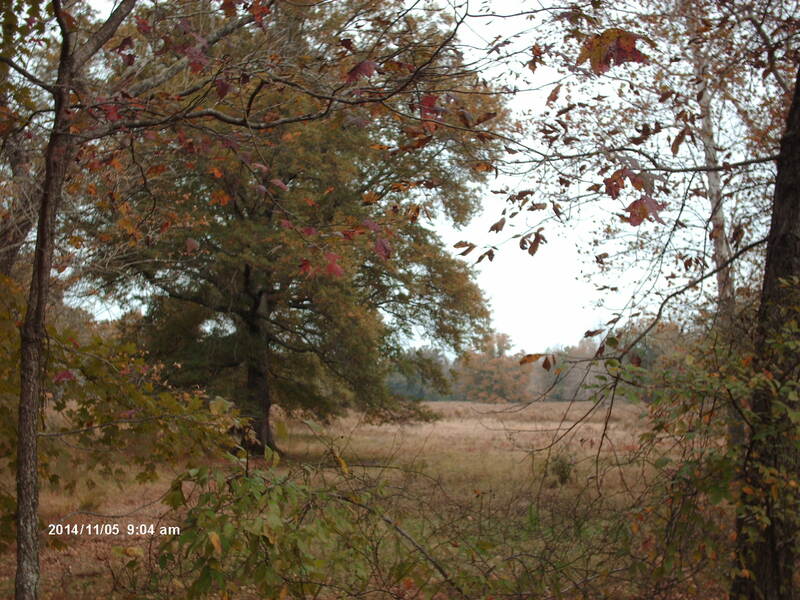 The record tree of this species is found in Oglethorpe County and is 64 feet tall with a diameter of over 3 feet. Nutmeg hickory (Carya myritieformis) is another regionally rare tree with disjunct populations. The largest known specimen is found in Floyd County and is 115 feet tall with a diameter of about 2 feet. Some species of trees are fairly common throughout the southeastern coastal plain, but the largest specimens are found in Georgia. Ogeechee lime (Nyssa ogeche), a tupelo with an edible fruit, is most common in Georgia. The largest known is found in Toombs County and is 45 feet tall with a diameter over 6 feet. Swamp privet (Foresteria acuminata), a member of the olive family, grows throughout the southeastern coastal plain. The largest known specimen, also found in Toombs County, is 47 feet tall with a diameter of 11 inches. Chalk maple (Acer leucoderma) is a rare regional tree found on the inner coastal plain and piedmont. The largest specimen is found in Greene County and is 64 feet tall with a diameter of a foot. Florida maple (Acer barbatum) is a little more widespread than chalk maple. The largest known Florida maple is found in Floyd County and is 91 feet tall with a diameter of almost 4 feet. May hawthorne (Crataegus aestivalis), produces a fruit used in making jelly. The largest known is found in Haralson County and is 40 feet tall with a diameter of over 1 foot. Viburnum possumhaw (V. nudem) is another regional borderline shrub with a record specimen found in Georgia. The largest known is found in Oconee County and is 33 feet tall with a diameter of 4.4 inches. Aloe yucca (Yucca aloensis) grows in coastal scrub along the southeastern coast as far north as New Jersey. The largest known is found in Brantley County and is 14 feet tall with a diameter of 6 inches. Myrtle oak (Q. myrtifolia) ranges mostly in Florida but the northernmost population in Camden County, Georgia holds the record specimen which is 36 feet tall with a diameter of 9.5 inches. The most impressive national record trees in Georgia are from species found across most of eastern North America. The largest red mulberry (Morus rubra) is found 20 minutes from my house in Richmond County. It is 54 feet tall with a diameter of over 7 feet–truly an impressive tree harking back to primeval times. This national champion red mulberry tree is located about 20 minutes from my house in Richmond County. 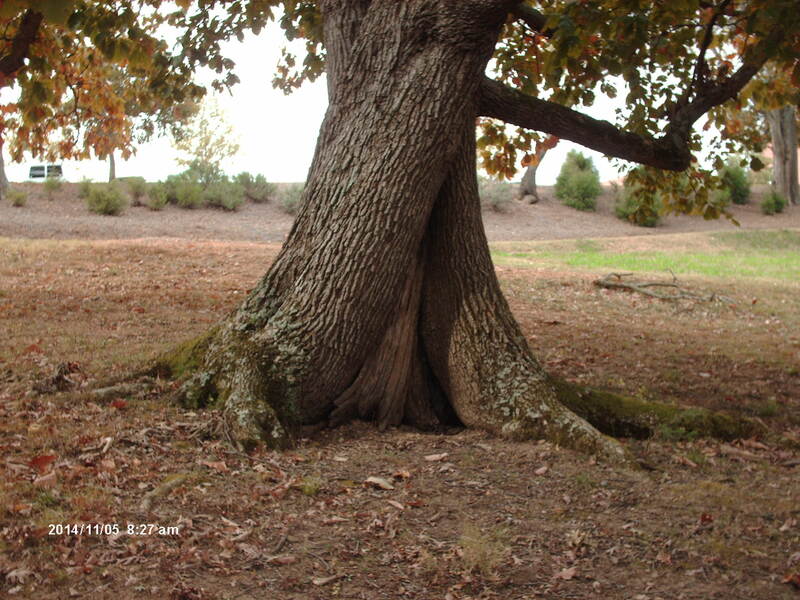 A post oak (Q. stellata) in Jackson County is 86 feet tall with a diameter over 6 feet. The national champion post oak is in Jackson, County, Georgia. National champion Ogeechee Lime Tupelo in Toombs County. 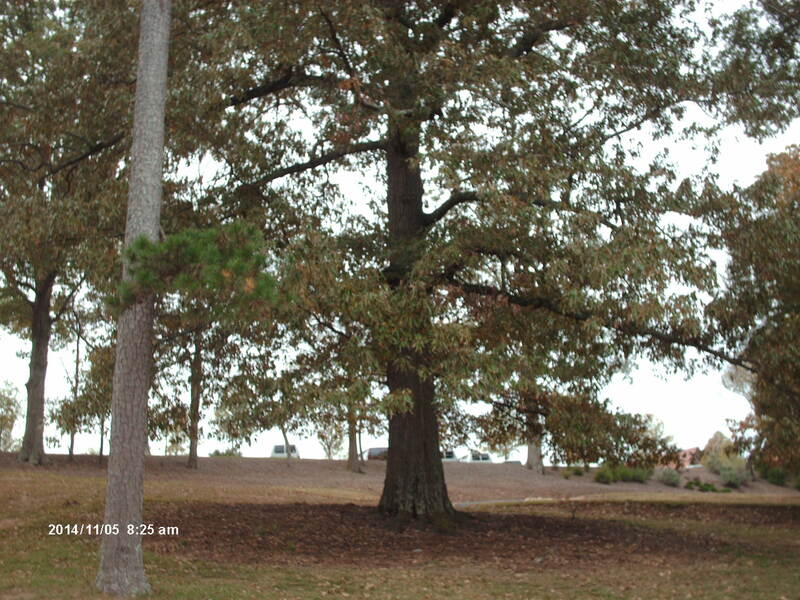 A southern red oak (Q. falcata) in Upson County is 137 feet tall with a diameter of 9 feet. Unfortunately, there’s no photo of it online. An eastern red cedar (Juniperus virginiana) growing in a Coffee County cemetery is 54 feet tall with a diameter of over 6 feet. National champion Eastern Red Cedar growing in the Lane Hill United Methodist Church Cemetery, Coffee County, Georgia. The largest Alabama black cherry (Prunus serotina alabamensis), a subspecies of black cherry, is found in Floyd County and is 49 feet tall with a diameter of 9 inches. This is much smaller than the state record black cherry found in Ellijay which is 83 feet tall with a diameter of over 5 feet. Georgia has some champion specimens of common borderline shrubs too. The largest flatwoods plum (Prunus umbellata) is found in Union County and is 43 feet tall with a diameter of 11 inches. The largest smooth sumac (Rhus glabra) is found in Twiggs County and is 52 feet tall with a diameter of 11 inches. The largest mountain laurel (Kalmia latifolia) is found in Fannin County and is 20 feet tall with a diameter of almost 20 inches. The largest buttonbush (Cephalanthus occidentalis), favorite food of the mastodon, is found in Screvin County and is 22 feet tall with a diameter of 5 inches. Some of the most impressive trees in Georgia are not national record trees. Below are photos of a few. Georgia’s state champion black oak is located next to a convent in Fulton County. William Bartram walked through a forest of gigantic oaks, some larger than this. Too bad, pioneers destroyed that forest. Georgia’s state record eastern cottonwood also located in downtown Atlanta. Georgia’s state record beech is located in Lawrenceville, Georgia where my grandfather lived until he was 16. The 2nd highest scoring trees in Georgia are bald cypresses. The highest scoring tree in Georgia is this live oak in Ware County. The black oak growing next to the convent is over 7 feet in diameter. This is not as large as many of the black oaks William Bartram observed in a 7 mile long forest he traveled through in 1775 (See: https://markgelbart.wordpress.com/2011/04/11/william-bartrams-magnificent-forest/) Some of those trees measured 11 feet in diameter. Loggers destroyed most of Georgia’s forests between 1865-1945. The primeval forests prior to the Civil War undoubtedly held specimens larger than today’s state and national champions. However, we are living during a climatic phase favorable to the rapid growth of trees. The largest tree specimens lived during interglacials and interstadials when CO2 concentrations and precipitation levels were high. If we preserve enough green space on fertile ground and allow remaining old growth forests to remain intact, there is hope that trees such as Bartram encountered may grow once again. I daydream about living in Georgia when it was a wilderness unmodified by man, and I spend a lot of time thinking about the flora and fauna as it used to be. So it’s nice when I get a chance to take a real stroll in nature, even if it is just the ruined remnants. 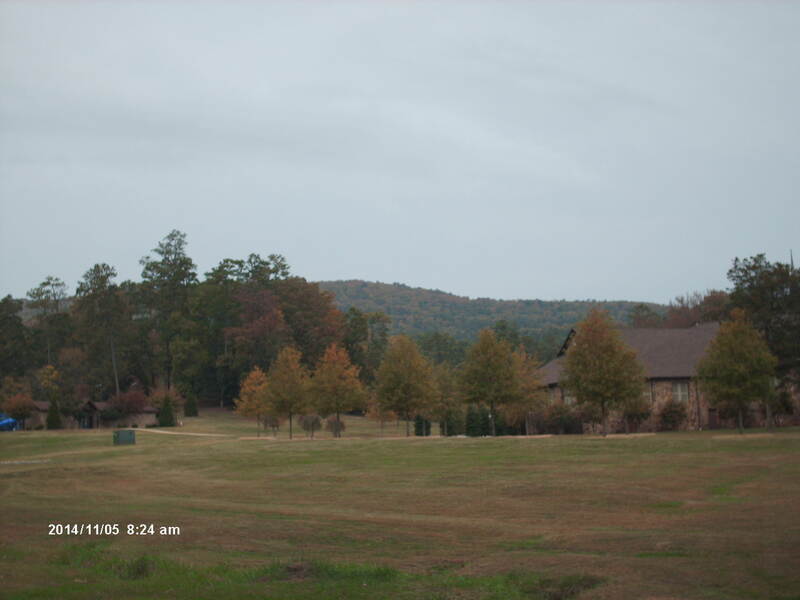 My favorite accessible natural area is Berry College Campus. I always see more wildlife there than anywhere else I’ve ever visited. Deer are abundant here but I couldn’t get any decent photos of them yesterday. The bird life is varied: bald eagles, peregrine falcons, turkeys, Canadian geese, crows, killdeer plovers, bluebirds, pileated woodpeckers, and many others. Like the deer, the birds didn’t want to cooperate with my camera either. I had time for just a short walk yesterday and found some interesting trees. Trees are much easier to photograph than animals. A view of Lavender Mountain in the background. 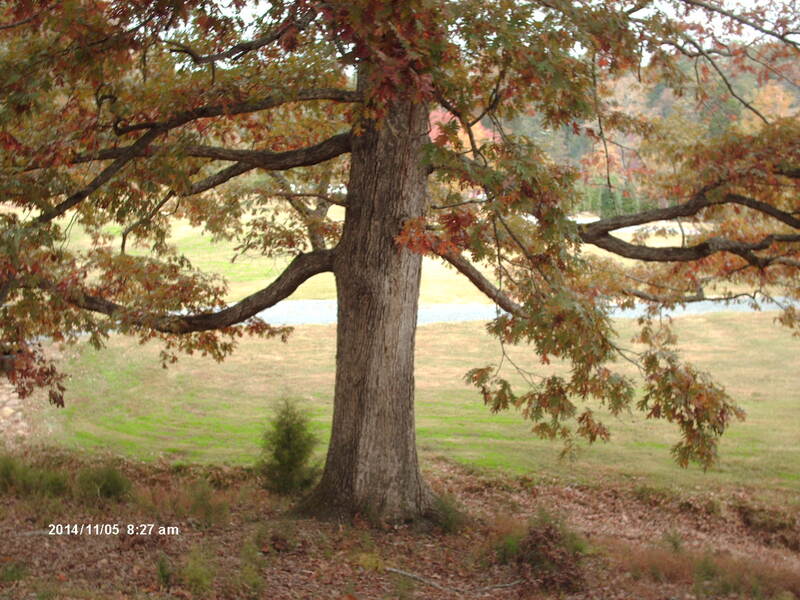 I think this southern red oak, also known as Spanish oak, had a diameter of about 4 feet. I was impressed with a southern red oak (Quercus falcata) that I had found. It appeared to have a diameter of about 4 feet at human shoulder height. But then I looked up the record. 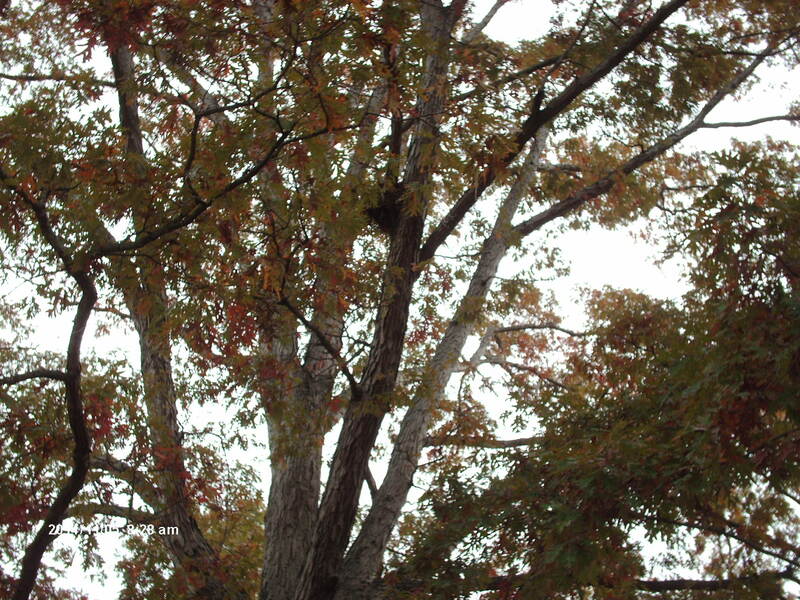 Georgia has the national champion southern red oak in Upson County with a diameter of about 11 feet at 4.5 feet above the ground. Wow! I’d like to see that one. Montane chestnut oak. Also pretty thick. The same tree as above from a different angle. Note how twisted it is at the base. I think this montane chestnut oak (Q. prinus) had a diameter of at least 4 feet, but it was hard to judge because of the twisted shape. 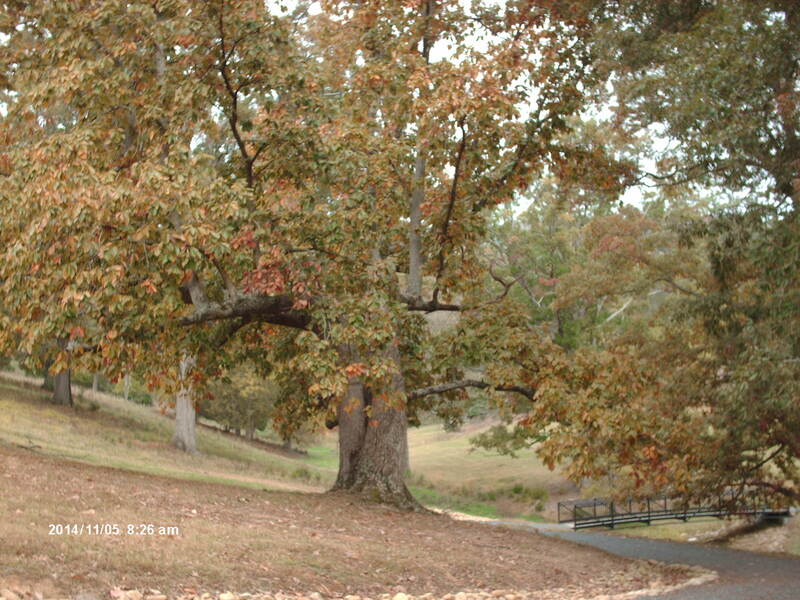 The state record montane chestnut oak tree in diameter is found in Fulton County and it is between 5 to 6 feet. This tree might come close to that tree in circumference. I’ll have to bring a tape measure with me next time I visit Berry College campus. White oak with a diameter of about 4 feet. The white oak (Q. alba) pictured above doesn’t even come close to the Georgia state record white oak which is found in Fayette County and is at least double in size. This is the Georgia state record white oak. It’s double the size of the specimen I saw yesterday. Note the squirrel’s nest up in this white oak tree. The squirrels are happy with all the oak trees on Berry College Campus. Fox squirrels are listed as a species that occurs on the Berry College Wildlife Management Area, but I’ve only seen gray squirrels. I won’t believe they really have fox squirrels here until I see one myself. This view from Little Texasville Road in Berry Wildlife Management Area. I love this kind of landscape…big old trees surrounded by open grassland. I envision Pleistocene landscapes in Georgia resembling this. Just add some bison, horses, and mammoths to this scene. The Berry WMA located behind Berry College Campus is the largest wildlife management area in Georgia. This time of year, hikers aren’t supposed to walk on the trails. Hunters might accidentally shoot them. You are currently browsing the GeorgiaBeforePeople blog archives for November, 2014.